Was Bill Nye your favorite science guy growing up? He certainly was for David Neering of Crivitz, a community of 972 people in Northern Wisconsin. For youth like Neering, Nye’s popular educational series made science accessible. Using popular culture parodies, the famously slender scientist in a lab coat explained concepts like air pressure in a manner that resonated with his viewers. More importantly, his work paved the way for a generation of youth set on taking their interest in science to the next level, making it a career intention. That’s exactly what Neering decided after completing a physical science course his freshman year. His career focus became more refined after taking a year of chemistry his sophomore year. He wanted to work with chemicals and make reactions happen for a living. At the same time Neering was thinking about his career path, the State of Wisconsin Department of Public Instruction called for full implementation of their Academic and Career Planning (ACP) requirements by all school districts. The Crivitz School District chose to implement a required job shadow for juniors as part of their ACP requirements. Daren Sommerfeldt, Business Education teacher, is leading the job shadowing effort in Crivitz, using his business connections to find the right fit for students. Students fill out career surveys with the guidance counselor and he reviews them. Neering is his sole chemist. Sommerfeldt had heard of a custom chemical manufacturer, ChemDesign, in Marinette, a community 35 miles to the east, at the border of Michigan’s Upper Peninsula. He contacted Brian Bourgeois, Employee Development Manager, to ask if his organization would offer his student the opportunity to get a feel for the process and careers involved in chemistry. Bourgeois had experience with college job shadow programs, but not high school. Their approach was to treat the opportunity the same, providing Neering the opportunity to meet with process chemists and lab technicians. 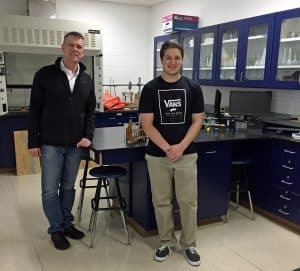 Within one week of the call, Neering was touring the ChemDesign campus, meeting with Roman Leiser, a process chemist and graduate of St. Norbert College. Leiser’s work environment looked like what Neering had expected of a chemist’s laboratory, complete with Erlenmeyer Flasks and precise scales. His tour of the quality control lab was a completely new experience. It felt more industrialized, with specific areas devoted to different types of analysis. Mindy Doubek, QC Laboratory Manager, showed him the melting point of compounds. Until that day, he had never seen a chemical test like that before. Neering also had never seen the full scale production at a chemical plant. He was ‘blown away’ by the big the reactors, capable of multi-step synthesis processes. With his valuable job shadow experience completed with ChemDesign, Neering feels confident in his plans after high school graduation. The active junior, who works 35 hours a week at McDonalds, along with participating in school forensics, quiz bowl and cheer squad, will complete his pre-requisite courses at the University of Wisconsin – Green Bay and will transfer to Madison to finish his degree in chemistry. This entry was posted in Blog, News and tagged Academic and Career Planning, Chemistry Job Shadow, Crivitz School District, St. Norbert College, Wisconsin Department of Public Instruction. Bookmark the permalink.